Only Mason Adventures offers this exclusive stretch of unexplored river in a choice of two daily rafting sessions over 33 rapids where you will travel through formerly unseen river splendor on the first section of the tour with daring, exciting and challenging new rapids to add to the thrill of Bali’s longest white water rafting trip. The class 2 & 3 rapids include encounters on vortexes of swirling and funneled waters, natural ramps and sudden drops in elevation and adrenaline pumping action which can be safely experienced by anyone from 5-65 years of age. 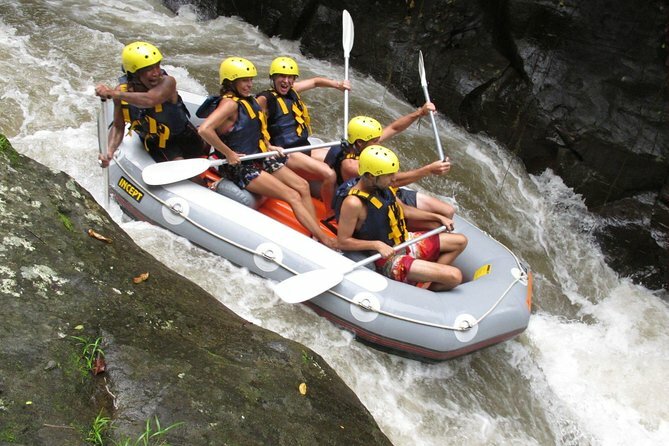 Go beyond the 21st century with our revolutionary new White Water Rafting operation. Our center facility has been ingeniously designed to include a futuristic Rafting Reception Centre, ‘State of the Art’ equipment outfitting gallery and most exclusively, a world first experience to raft on previously untouched waters from our new starts point further north on the Ayung River.